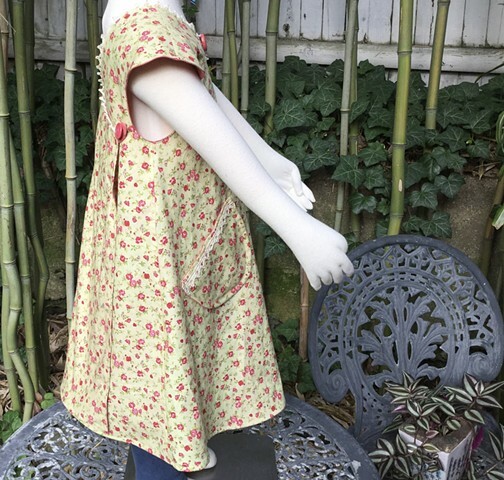 Sweet, old fashioned cotton print, faced in coral fabric (a duvet cover in a pervious life), over-lapping back panels button toward the sides, which can easily be adjusted as she grows. Vintage ecru crochet adorns the neck edge and slanted pockets and surrounds the centerpiece coral button. Built-in cap sleeves, big front pleat for extra room, sized L (5-6 years), measures 24” across chest by 32” shoulder to hem length. $90, machine washable, $100, made by the designer herself and shipped free to any address in the U.S. #255.